Next on our visual room enlargement series is a pro tip which gives details on how to make a small room look bigger with curtains. As we once stated in a previous post about how to choose the right curtains for your home, we explained the importance of the need to follow some important practical steps when you’re looking to choose your interior’s curtains. Before you go on to read this post, we are hoping that you have read the previous posts on this series where we talked about how to make your home look bigger with the use of a wallpaper, and how to create a visually large room with the aid of mirrors. Now to today’s post, a lot of people find it hard to believe that a small room can be made to look bigger with the aid of certain curtain types or materials, lol, trust me, this isn’t magic, it’s just as simple as ABC. In order to help you understand better, we will b going straight to the point. 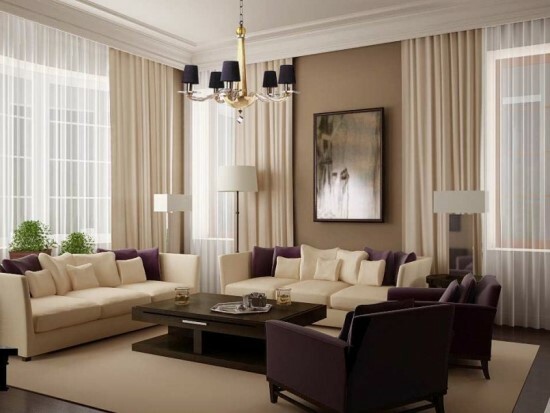 Curtains are one of the home's greatest utiities for space management, believe it! Now, how exactly do you make a small room look larger than it really is by using curtains? First and most important, be sure to use a very light and weightless fabric curtain, also, you should pick a light-colored curtain with bright shades. If possible, choose a curtain color that matches your walls and ceiling color, or a similar color shade. Now make sure that your curtains are very long. A curtain that starts from a position as high as your ceiling, and drapes on the ground creates the visual effect of a very high room. To make the room look expanded, a curtain with horizontal stripes should be used, however, if you are looking to make the room look taller, then we’re talking about a case of implementing curtains with vertical stripes. Make sure that your curtain completely covers the windows at both sides, this will leave just anyone wondering how large the windows of the room are, thus creating the impression that the room is large, it’s a simple brain trick. Another important pro tip why it is important to choose a curtain that is light is this; the curtain is in most cases, the first point of contact between the room and the sun rays. A constant heat from the sun can leave your curtains with a faded look, you definitely wouldn’t be proud of that. Make sure that the drapes of the curtain on the floor aren’t so much or else you will find yourself crating a mental path that makes you walk somewhat further from the window, thus making the home feel small. A ceiling to tile curtain height is just perfect. Now you see, It’s not voodoo… please share and drop your comments, we’ll love to read from you.